Perhaps you don't remember, or you never knew, that the NC General Assembly took away your ability to choose one Supreme Court candidate over another. House Bill 222 decreed that North Carolina voters no longer get a choice between two candidates. We now only have a choice between retaining a current justice or not, and if we should choose "NOT," then Governor Squishy gets to appoint a replacement. Does that sound like democracy to you? No, it sounds like a naked political ploy to insure that Bob Edmunds, the only Supreme Court justice up for reelection in 2016, gets to keep warming his square footage of upholstered leather. 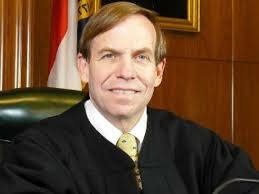 Allowing Judge Edmunds to appear on the 2016 ballot unopposed is a baroque twisting of fair elections, but what else is new with this Raleigh bunch? The state constitution specifies that judges to the Supreme Court shall be elected by the people. A "retention election," as the new innovation is called, offers nothing that resembles a regular election, and the lawmakers are counting on the public not knowing enough to say "HELL NO!" I bet that's occurred to them. The ruling party puts up a candidate or proposition and the voters can say yes or no. This is the way it worked most recently in the Soviet Union, although it was pioneered by Napoleon III of France during the so called Second Empire (1852-71). It is sometimes called plebiscitary democracy but it violates the spirit of fair, representative, and truly democratic government and is deliberately designed to divide, frighten, and intimidate one's opponents. It works for a while but what usually comes next is flight (voluntary or forced) of political opposition, cynicism and corruption of the officeholders who have relied on this method of maintaining power, popular unrest (requiring subjection) and ultimately coups, revolution, and/or violence against the ruling party. This is the opposite of what we should want for our nation. Thus endeth the history lesson for today.